Add weather to your watch face. While viewing the face, firmly press the display, then tap Customize. Swipe left until you can select individual face features, tap the one where you’d like to see weather info, then turn the Digital Crown to choose Weather. When you’re finished, press the Digital Crown. Choose the city for the watch face weather. 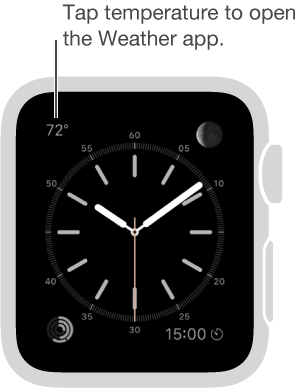 Open the Apple Watch app on iPhone, tap My Watch, then go to Weather > Default City. Open the full Weather app. Tap the temperature on the watch face.